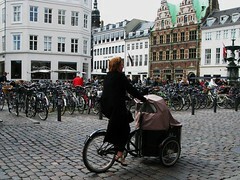 Here's a few classic cargo bike shots from the past few days in Copenhagen. Above is a typical cross section of Copenhageners waiting for the light to change, including man in suit on his Nihola. 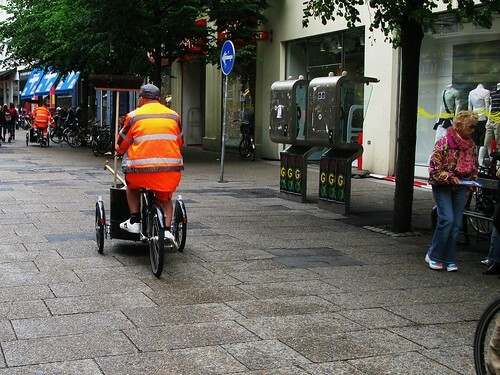 Streetcleaners on one of the pedestrian streets in the heart of Copenhagen, riding customized Nihola cargo bikes. The chap in the background is picking up some trash with a 'grabber', while seated on his bike seat. 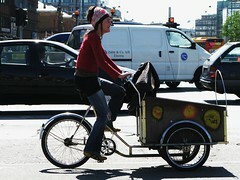 The Royal Danish Post uses customized Christiania Bikes for the post-heavy routes in the city centre. A charmingly personalized Christiania bike on the City Hall Square. 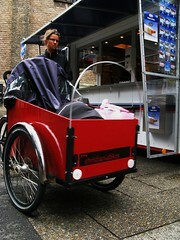 A Christiania bike rolling past a traditional Danish sausage stand - 'pølsevogn' - on Købmagergade in the heart of the city. A Nihola in its natural environment. Copenhagen C.